On the evening of Friday 19, 2014 the Crisalida team had a meeting at David’s rented house (our Rancho!) where the team had an opportunity to update each other and provide individual summaries of their experiences since David’s arrival the week before, and also to speculate on the upcoming short term and long term endeavors of the Crisalida project. The team summed up the activities that had taken place the week prior and critiqued what went well and what needed work. A couple notable events was the acquisition of the Crisalida van, and the addition of Lucinda Perez as the Crisalida Art’s Project accountant/secretary, and Gina Chapa, as a Crisalida team supervisor, manager of formal documentation, and manager of projects pertaining to the van. Aside from relating to each other notes from the meetings that had taken place up until this point. The team got a chance to speculate on the future projects that are in the works. One is the Crisalida listening booth that will be on site at the Galilee Center in Mecca on January 8, 2015. Another point of discussion was the upcoming multimedia festival. where the setting of the event will be, and what projects will be actualized. Perhaps what took up most of the discussion was talk and speculations on what will happen once the newly acquired Crisalida van has it’s modifications done and is operational. Sofia Enriquez, the Crisalida member who has her finger on the pulse of the art world, had a notebook full of ideas and projects waiting to be put into action. Such projects included mobile art workshops, that may be taken to events, housing complexed, and local communities once the van is ready. Having mobile art exhibitions was also an idea that got some momentum, it entailed having established local artist donate some of their art and have it on exhibit with the van. So if there was an event or etc. 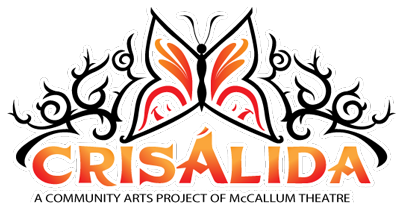 the crisalida team may have a mobile art exhibit ready to roll out and display on site. The team also talked about potential plans to exhibit the van at the Coachella Valley Music and Arts Festival the upcoming April of 2015 once the Crisalida van is fully modified and operational. After all the important notes were touch on, at the conclusion of the meeting, the team bid farewell to David, and David bid farewell to the team by serenading the folks in attendance with a poem and a song accompanied by the playing of his guitar. Look out for the Crisalida van at community events around the Coachella valley starting early March 2015 or sooner.